A wicked tea to entice the licorice lovers. Combining the refreshing properties of peppermint with the tasty treats of licorice and aniseed myrtle, this specialty blend will linger long on the palate. Particularly beneficial after meals to settle the tummy or satisfy your sweet tooth. I have to be honest – I didn’t really like this blend too much at first. I found that I needed to add a little bit of honey to it to make it palatable for me, otherwise the flavors were just too harsh for me. But with a little sweetening, this becomes a very delicious cup! The licorice flavor is strong, to the point of being quite sharp without the honey. But with the honey, I find that the licorice is softened just enough to taste a bit like a good old fashioned licorice. The mint is not quite as strong as the licorice flavor, and in the competition, the licorice wins out at the start of the race. However, the mint perseveres, and there is a crisp, clean minty aftertaste. One thing I wanted to mention about this tisane. I was experiencing some heartburn before I started drinking this tea… notice, I said WAS. The heartburn is gone now, and I’m only about halfway through my cup! For this reason, I recommend keeping this tisane on hand. It tastes way better than those chalky antacids, and based upon this experience, I think it also works better than the antacids do. 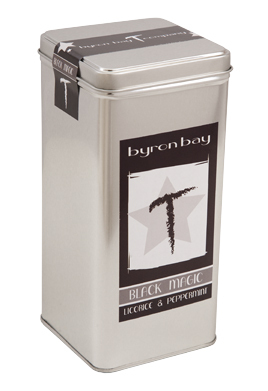 A very strong herbal blend that is for those licorice lovers out there!